GunBroker.com Seeks Declaratory Relief Against Heckler & Koch and the Trademark Enforcement Efforts of Continental Enterprises, Inc.
On May 14, 2009, GunBroker.com, LLC (“GunBroker”), the owner of the website www.GunBroker.com, filed a declaratory relief action against Heckler & Koch Inc. (“H&K”), the U.S. subsidiary of the German firearm manufacturer Heckler & Koch, GmbH, in the U.S. District Court for the Middle District of Georgia. 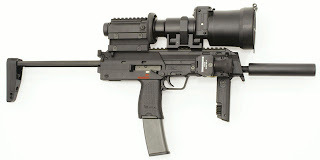 See GunBroker.com LLC v. Heckler & Koch Inc., Case No. 09-cv-00051 (M.D. Ga.). A copy of the complaint can be downloaded here. H&K is the owner of the registered HK logo trademark (pictured above) as well as numerous other registered marks that H&K uses in connection with certain models of H&K firearms such as USP, P7, and MP7 (some of which are also occasionally used in connection with other items including swords and knives). GunBroker’s website offers an online auction service for third parties to sell merchandise such as firearms, knives, swords, and hunting equipment and accessories to interested parties. Sellers create the auction listing and submit it to GunBroker, which then adds the auction to its site, administers the auction, notifies the auction winner, and provides details on how the winner can contact the seller. GunBroker’s Website User Agreement specifically prohibits the posting of items for sale that violate any third party’s intellectual property rights, and GunBroker provides a mechanism for trademark holders to report any violations. According to the complaint, on August, 27, 2008, GunBroker’s predecessor-in-interest received a letter from the “Office of the General Counsel” for Continental Enterprises, Inc. (“CE”). The letter indicated that CE had been engaged by H&K to protect H&K’s intellectual property and that several hundred auction listings on GunBroker’s website violated H&K’s trademark and copyright rights. The letter enclosed a 16 page printout from GunBroker’s website that showed a list of auction listings (over 340) posted by third party sellers on the website who were attempting to sell merchandise and in some way using one or more of the H&K trademarks. The basis of CE’s engagement to enforce H&K’s intellectual property rights was a letter from James E. Baker, Jr., an attorney with the Baltimore, Maryland law firm of Baxter, Baker, Sidle, Conn & Jones, P.A. (the “Baxter Firm”), which purportedly confirmed that H&K had engaged the services of CE to identify and investigate any unauthorized uses of H&K’s intellectual property. Apparently, however, the letter did not explain the relationship between the Baxter Firm and H&K nor did it indicate whether or not the Baxter Firm is an agent of H&K or otherwise entitled it to act on behalf of H&K. According to the complaint, the owner of CE is Mr. Karl Manders, a career private investigator (but not a lawyer) who, through his company, concentrates exclusively on the enforcement of intellectual property rights. GunBroker believes that CE obtains a percentage of any settlement proceeds that CE receives from its efforts. CE has supposedly acted on behalf of such companies as Heineken USA, Inc., Just Born, Inc., and Big Dog Holdings, Inc.
GunBroker’s complaint notes that the list of allegedly infringing auctions provided by CE did not distinguish between allegedly infringing use of H&K’s trademarks and the fair use of H&K’s trademarks by sellers listing authentic H&K products or otherwise making a fair use of H&K’s trademarks. Moreover, despite GunBroker’s request, neither CE nor H&K have used the mechanism on GunBroker’s website, to report a specific violation or to clarify which if any, specific postings on GunBroker’s website that CE or H&K believe infringe on H&K’s trademarks. Based on CE’s actions and threats regarding GunBroker’s alleged trademark infringement of H&K’s trademarks through the third party auction listings on GunBroker’s website, GunBroker maintains that a substantial controversy exists between the parties to warrant GunBroker’s request for declaratory relief. GunBroker seeks a declaratory judgment that it has not infringed H&K’s trademarks, that it has not committed any contributory trademark infringement through the auction listings by sellers comparing their product to an H&K product, selling products that are compatible with an H&K product, selling products that are a “knock-off or look alike” to an H&K product, or reselling a used H&K product, and that such uses of H&K’s trademarks by sellers in their auction listings is fair use. Since a cease and desist letter cannot be the grounds for a civil lawsuit, do you think H&K will move to dismiss or do you think they will fight the issues? Review the U.S. Supreme Court's decision in MedImmune, Inc. v. Genentech, Inc. 549 U.S. 118 2007) and tell me if you still feel that way. Finnegan also has a good article about the impact of that decision in the realm of trademark cease and desist letters -- http://www.finnegan.com/resources/articles/articlesdetail.aspx?news=cbd5bc4a-14e7-43bb-a7fb-58881ecee5da. C&D's are definitely grounds for a DJ action, so I definitely agree with Mr. Gile. What I'm more interested in is the pro res allegations. I wish more parties would plead these to get the scummy lawyers out of our bar. Based on the facts as presented, I can't imagine who H&K/CE has any trademark claim. While I'm well aware of the recent ebay cases (which didn't survive MSJ), guns are designed to last as long as possible. There is no "expiration date" on any firearm, especially of the type H&K manufactures. Any ruling adverse to Gunbroker would basically be a total abrogation of first sale. And I would love to see how Quanta affects trademark law.